Virginia Water Radio: Episode 365 (4-24-17): Where’s Stormwater Get Started? Ask a Middle Schooler! Episode 365 (4-24-17): Where’s Stormwater Get Started? Ask a Middle Schooler! All Web addresses mentioned were functional as of 4-21-17. From the Cumberland Gap to the Atlantic Ocean, this is Virginia Water Radio for the week of April 24, 2017. This week, we drop in on a group of Virginia middle-school students giving citizens a vocabulary test related to one of the Commonwealth’s most challenging water issues. Sound unbelievable? Well, just have a listen for about 35 seconds. You’ve been listening to Christiansburg Middle School students who attended Stormwater Education Day on April 12, 2017. The vocabulary list you heard included processes of the water cycle, also known as the hydrologic cycle; along with geographic features of watersheds, a term that people often interchange with drainage areas, drainage basins, or river basins. Water cycle processes and watershed features are key elements in stormwater: when, where, and how much of it occurs. Stormwater occurs when rainfall or other precipitation can’t seep—or infiltrate—into the ground, particularly when the precipitation lands on pavement or other impervious surfaces. Stormwater runs off over the land surface into water bodies or into drains and pipes that eventually lead to water bodies. During that runoff, stormwater can pick up various water pollutants, and high-volume stormwater can cause flooding and erosion. Such impacts, and the laws and regulations implemented in response, have made stormwater-management a far-reaching water issue, affecting local governments, homeowners, and businesses all over Virginia. Back in Christiansburg, students learning now about the water cycle, watersheds, potential contaminants, and the filtering potential of different materials will be the future idea-generators and decision-makers who’ll deal with this widespread and complicated issue. Thanks to Christiansburg Middle School students, teachers, and volunteers for lending their voices to this episode. And we close with some appropriate sounds for stormwater. The voices of sixth-grade students (and some adults) from Christiansburg Middle School in Christiansburg, Va., were recorded April 12, 2017, during Stormwater Education Day, held on the grounds of the Christiansburg/Montgomery County, Va., chapter of the Izaak Walton League. Thanks to Patricia Colatosti of the Town of Christiansburg and to Patricia Gaudreau of the Montgomery County School Division for organizing Stormwater Education Day and for allowing Virginia Water Radio to participate. Virginia Water Resources Research Center/Virginia Water Radio – recording terms related to stormwater. Learning stations on April 12, 2017, for Christiansburg Middle School’s Stormwater Education Day, at the grounds of the Christiansburg/Montgomery County, Va., chapter of the Izaak Walton League. The water (or hydrologic) cycle. 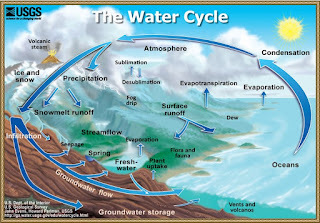 Diagram from the U.S. Geological Survey, “Water Science School/Water Cycle,” online at https://water.usgs.gov/edu/watercycle.html. Virginia’s major watersheds (river basins). Map by the Virginia Department of Conservation and Recreation, accessed online at http://www.dcr.virginia.gov/soil_and_water/wsheds.shtml. From the Virginia Department of Environmental Quality (DEQ), “Stormwater Management,” online at http://www.deq.virginia.gov/Programs/Water/StormwaterManagement.aspx. Danielle Guerin, “Wherever You Are, Stormwater’s On Your Street” and “Stormwater Information Sources,” August Virginia Water Central Newsletter, August 2010 (pages 3-7), available online at https://vtechworks.lib.vt.edu/handle/10919/49363. King County, Washington, “Stormwater glossary of terms and abbreviations,” online at http://www.kingcounty.gov/services/environment/water-and-land/stormwater/glossary.aspx. 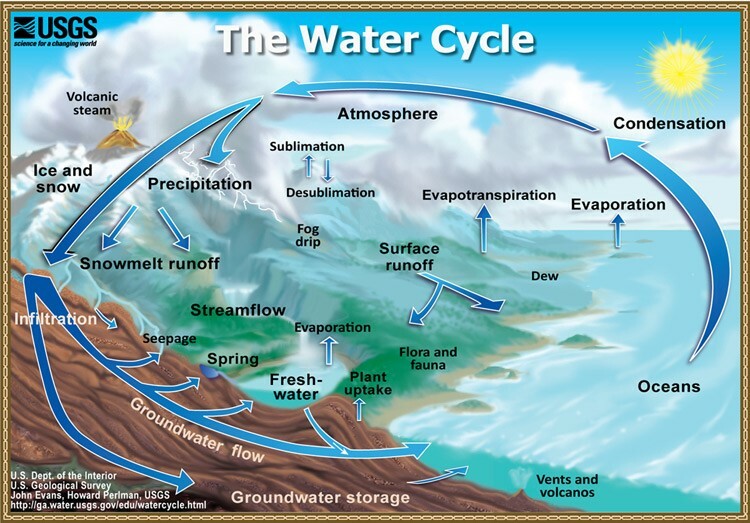 U.S. Geological Survey (USGS) Water Science School, “The Water Cycle,” online at https://water.usgs.gov/edu/watercycle.html; and “The Water Cycle for Schools,” online at https://water.usgs.gov/edu/watercycle-kids.html. U.S. Environmental Protection Agency (EPA), “NPDES Stormwater Program,” online at https://www.epa.gov/npdes/npdes-stormwater-program. Virginia Department of Environmental Quality, “Stormwater Management,” online at http://www.deq.virginia.gov/Programs/Water/StormwaterManagement.aspx. Code of Virginia, “Virginia Stormwater Management Act,” online via the Virginia Legislative Information System at http://law.lis.virginia.gov/vacodefull/title62.1/chapter3.1/article2.3/. Radford University, “Virginia’s Rivers, online at http://www.radford.edu/jtso/GeologyofVirginia/VirginiasRivers/Drainage-1.html. Virginia Department of Conservation and Recreation, “Virginia’s Major Watersheds,” online at http://www.dcr.virginia.gov/soil_and_water/wsheds.shtml; and “Hydrologic Unit Geography,” online at http://www.dcr.virginia.gov/soil_and_water/hu.shtml. The latter site provides detailed information on how watersheds are designated, plus access to interactive maps of Virginia’s watersheds. Virginia Water Resources Research Center, “Virginia Water Central News Grouper/Stormwater,” blog posts online at https://vawatercentralnewsgrouper.wordpress.com/category/stormwater/. Virginia Water Resources Research Center, Virginia Water Central Newsletter, February 2000, “An Introduction to Urban Stormwater,” by Rich Wagner (pages 1-7); and “Divide and Confluence” (pages 8-11); available online at https://vtechworks.lib.vt.edu/handle/10919/49316. The two articles give basic introductions to stormwater and to watersheds, respectively. All Water Radio episodes are listed by category at the Index link above (http://www.virginiawaterradio.org/p/index.html). See particularly the following subject categories: Rivers, Streams, and Other Water Bodies; Science; Weather. Water cycle: Episode 191, 12/9/13, Episode 198, 1/27/14. 5.7 – constant change of Earth’s surface (including weathering and erosion, and plate tectonics). GOVT.7 - national government organization and powers.